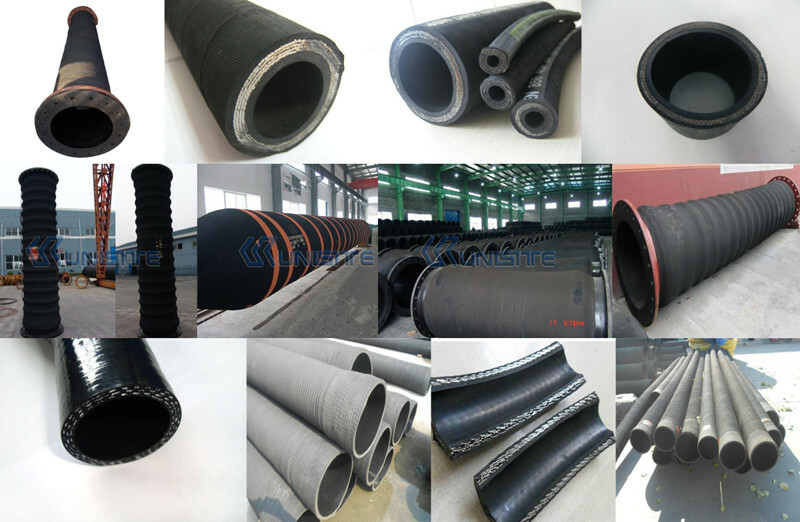 Product categories of Rubber Hose, we are specialized manufacturers from China, Flexible Rubber Hose, Hydraulic Rubber Hose suppliers/factory, wholesale high-quality products of Rubber Air Hose R & D and manufacturing, we have the perfect after-sales service and technical support. Look forward to your cooperation! Rubber Hose, steel wire braided hose. Hose within the layer, a layer of steel wire braided layer and outer glue layer. Suitable for conveying fluid, such as alcohol, fuel oil, lubricating oil, emulsion, etc..Compared to the civilian hose, industrial work environment more complex, more bad, equipment requirements for conveying pipe are more demanding, so industrial hose from design, material selection to production, transportation and eventually storage have strict norms and standards. The size of the industrial hose can be more widely, the pressure temperature range is wide, and the chemical resistance is higher. Applications of industrial hose covers various industrial manufacturing and circulating field. It is widely used in petroleum, chemical industry, ship, dock, a tanker, agriculture, food, beverage, pharmaceutical and other industries, and hot and cold water, steam, ventilation, cooling, fire protection, hydraulic, medium such as air, water, fog, mud, sand, iron tablets, etc.. In addition, there are common inside and outside the glue between the steel wire, the application of vacuum. There are conductive wire, applicable to the production of a spark of the operating environment, such as fuel, etc..
Water hose. For irrigation, gardening, construction, fire protection, equipment and tank cleaning, agricultural fertilizer, faeces, industrial sewage drainage. In the plastic material with EPDM, PVC in the majority. Hot water and steam hose. Used for cooling water, cold and hot water and food processing, especially for hot water and saturated steam of dairy products. In the majority of EPDM materials. Beverage and food hose. Used for non fat, such as milk, carbonic acid, orange juice, beer, animal and vegetable oils, drinking water, etc.. In the majority of NR or synthetic rubber materials. Usually need to have food grade FDA, DVGWA grade, KTW or CE and other standard qualification certification. Air hose. For compressor, pneumatic device, mining, construction, etc.. Inside the plastic material with PVC, NBR compound, PU, SBR are in the majority. Usually requires strict application of pressure. Welding hose. For welding, cutting etc.. In the majority of NBR or synthetic rubber material, outside the gel is usually the color of red, blue, yellow and so on to show the special gas. For the heat, dust, smoke, chemical gases etc.. Thermoplastic materials, PVC in the majority. Usually the tube has a retractable design. Material suction hose. For gas, mist and powder, granules, fibers, gravel, cement, chemical fertilizer, coal dust, sand flow, mixed clay, gypsum, etc. containing solid particles of liquid transportation. Inside the plastic material with NBR, NR, SBR, PU are the majority. Usually the adhesive wear resistance is higher. Oil hose. For fuel, diesel oil, kerosene, oil, etc.. Inside the plastic material with PVC, NBR compound, SBR are in the majority. Usually between inside and outside the plastic conductive wire, to prevent the mars. Chemical hose. Used in acid, chemical solution, etc.. In the majority of EPDM materials. Usually such a need for custom materials and design.